AgroAtlas - Relatives - Malus orientalis Uglitzk. 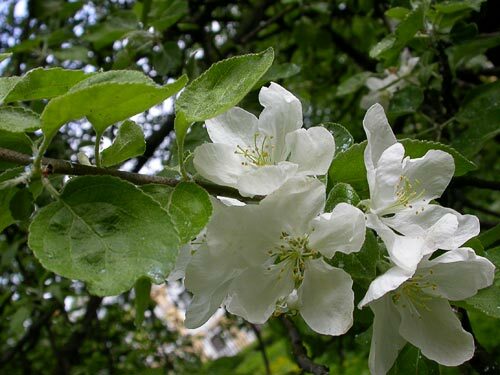 - Oriental wild apple. Malus orientalis Uglitzk. - Oriental wild apple. Family Rosaceae Juss., genus Malus Mill. Malus montana Uglitzk., Malus orientalis subsp. montana (Uglitzk. )Likhonos, Malus sylvestris subsp. orientalis (Uglitzk.) Soo. Tree up to 10 m tall with dark gray branches and without thorns. Young offshoots are dark brown, slightly tomentose-pilose. Leaves are 3-8 cm long and 1.5-3.5 cm wide, varying in shape (ovate-lanceolate, oblong, or elliptical), typically with a cuneate base and a barely expressed or short cusp on the top, smooth-edged at the bottom, serrate-dentate further along the edge, usually with very large or somewhat obtuse denticles in the upper part. Young leaves are sparsely pilose above with deeply impressed lateral veins, densely white-tomentose below. Mature leaves are pubescent only along the veins, while below the veins are usually prominent. Petioles are 2-4 times shorter than the blades, more or less tomentose-pilose. Flowers are about 4 cm in diameter, 4-6 in an umbel, set on densely tomentose-villous pedicels 8-12 mm long. Sepals are short, narrow, triangular, sharp, prostrate and almost bare inside, densely tomentose outside; remain with fruit. Hypanthia are inversely conical, very densely tomentose. Corollas are white or pale pink. Fruits are 2-3 cm in diameter, round. Entomophilous. Ornito- and zoochore. Species is characterized by rapid growth. Propagated by seed, root and softwood cuttings; often develops stool shoots. Blossoms in April-May; fruit ripens in August-October. Chromosome number is unknown. Occurs in the Crimea (occasionally), the Caucasus, Turkey and Iran. Mesophyte. Photophilous. Undemanding to growth environments; tolerates dry and mildly saline soils. It grows individually or in small groups in the second story of broadleaf and coniferous-broadleaf mountain forests, on forest edges, in glades, and along riverbanks. It grows in the mountains at elevations of up to 2,000 m above sea level. Used as food (fruit) and is melliferous. It is occasionally cultivated in the Caucasus. This species is an ancestor of the Caucasian, Crimean and a number of Western European varieties, including rosemaries, pippins, calvilles and rennets.